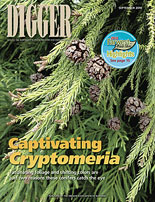 Fascinating foliage and shifting colors are just two of the captivating qualities that landed Cryptomeria (PDF) on the cover of the new issue of Digger magazine. • “Farwest continues its momentum in 2014” (PDF) — The 2014 Farwest Trade Show was a smashing success, with exciting new features and a more positive vibe on the show floor. • “Knowing your Phytophthora” (PDF) — It’s difficult, but important, to distinguish between different species of the deadly plant pathogen. • “Spreading nutrition over time” (PDF) — Knowing the effects of temperature and timing will help growers get the most from controlled-release fertilizers. • “Reaching toward Farwest’s future” (PDF) — The 2014 Farwest Trade Show is barely a memory, yet OAN Executive Director Jeff Stone says the association is already forging big plans for 2015.